This year at CES, big names for TVs and displays have again geared up with their most attracting products to amaze visitors from all over the world. Large size TV with ultra-high resolution is taking over the market with the leading brands presenting 8K TV. Meanwhile, OLED and Micro LED are still two of the most noticeable display technologies at the show as Samsung revealed its latest Micro LED display and LG showcased the world’s first rollable OLED TV. 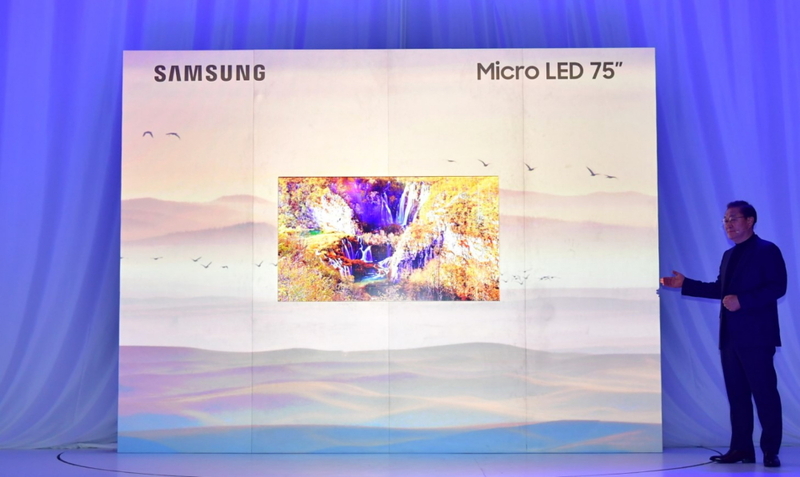 Samsung’s progress of Micro LED technology has been a focus of the industry since the launch of “The Wall”, the 146-inch Micro LED TV, at CES 2018. This year, the company lived up to the expectations of all even before the official start of CES. A new modular 75-inch Micro LED display and a 219-inch The Wall TV were presented at First Look CES event. The new 75-inch Micro LED display is with chips that are 1/15 smaller in comparison with “The Wall.” The modular displays can be spliced into customized ratios while maintaining its display quality. PlayNitride, a Taiwan-based Micro LED specialist who supplied its chips to Samsung for the new 75-inch Micro LED display, also demonstrate its achievement in Micro LED technology. The company presented two small sized Micro LED displays. One is a 5-inch display with a resolution of 350*170 with more than 180 thousands chips in a module. And the other 3.12-inch one is consisted of 786 thousands Micro LED chips (DPI 232) to achieve a resolution of 256*256. Sanan Optoelectronics also announced that several new products unveiled at CES 2019 have adopted Mini LED and Micro LED chips from the company. Sanan has begun large-scale production of RGB Mini LEDs and pushed the development of Micro LED. LG has brought a highlight at CES 2019 via the demonstration of the world’s first rollable OLED TV. The LG SIGNATURE OLED TV R (model 65R9) emerges from a black rectangle base which also serves as a sound box. The 65-inch and 3 millimeter thick OLED panel can open up to “Full View” mode as regular TV and minimize to one fourth of its size in “Line view” mode to provide functions including clock and home dashboard, offering time and weather information. It can also be fully hidden as “Zero View” by which the screen is rolled up in the base. 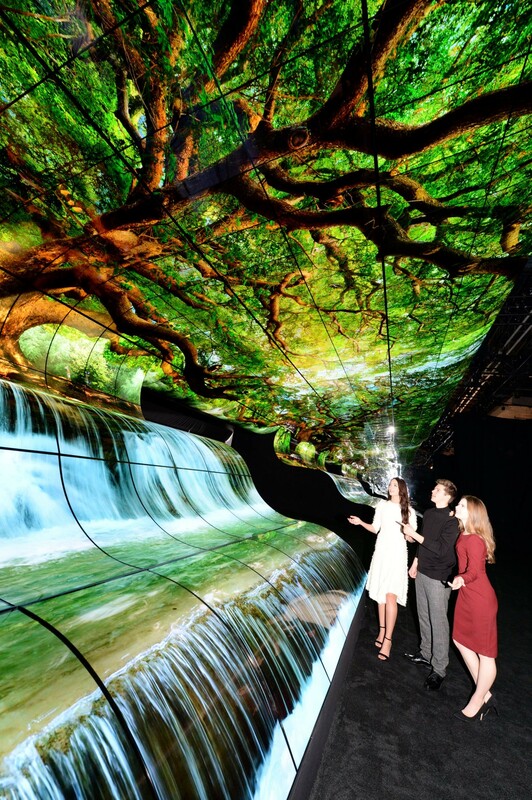 Apart from the rollable OLED screen, the company also created the “LG OLED Falls” which combine 260 units of curvy and flat OLED screen to form a large installation showing vivid images. LG noted that its OLED displays use self-lighting pixels that can be turned on and off individually for exact control of image brightness and quality, delivering infinite contrast ration optimized for high-dynamic range content.